For those of us who are passionate about the public spaces in our communities, this is an extraordinary time. The general awareness of the importance of a strong sense of place—to the economy, to our social fabric, to human health—is growing stronger every day. Placemaking is, at this moment, being transformed from a useful tool to a vital cause by people throughout the world. As one of those rare processes that can bring people with different objectives together under the same banner, Placemaking is uniquely suited to help us grapple with the complex challenges that we face in a globalized society. After almost four decades of working in this field, we are reaching out to peers new and old to form a Placemaking Leadership Council to consolidate and strengthen Placemaking as an international movement. The goal of the Leadership Council is to build a culture of mutual support amongst the do-ers and deep thinkers at the forefront of the Placemaking movement, creating a community of practice around this important work. Through our work, we know many people who are actively engaged in creating great places today; many of these people—the ones we refer to admiringly as “Zealous Nuts”—have already agreed to join this Council. But there are also people we don’t yet know who should be involved. If you are one of these people, you already know who you are; you've achieved something beyond most peoples' imagination, created one or more successful places, and are looking for an opportunity to share your stories and learn from others about how you might be able to raise the bar even more. If this is you, please read on. At the inaugural meeting of the Council this April 11-12th, we will gather in Detroit, Michigan, the North American capital of resilience (Background on how Detroit and Michigan are leading the way on Placemaking), to debate, discuss, celebrate and develop a strategy for creating a global agenda around Placemaking in cities. Another gathering will take place in Stockholm this June, through our partnership with UN-Habitat and the Ax:son Johnson Foundation. The Detroit gathering will be centered on case studies and demonstration projects, publications, films, and social media as ways of demonstrating the true power in place. Discussion will be structured around four agendas that we feel have the potential to transform cities if the focus is on the idea of place and Placemaking. And strengthening communities by creating new urban development models that re-orient our cities and towns around great multi-use destinations. The Council will be organized around four sub-committees, each of which will focus on one of these critical aspects of place-centered development. (Click here to read about the Transformative Agendas in greater detail). Their agenda-defining discussions will be guided by the three strategic themes of Place Governance, Place Capital, and Healthy Communities. Outcomes for each sub-committee will include research topics, benchmarks, potential partners, and implementation strategies that will drive progress and innovation amongst Council members and the wider global community of Placemaking practitioners and community change agents over the coming year. If your interest is piqued, please review the five criteria below to see if you might be a good fit for the Placemaking Leadership Council. If you meet several of these criteria, we encourage you to reach out and tell us more about what you do, and why you're passionate about the idea of place. 1.) You know about and understand Placemaking. You're well-versed in the movement's history, and can appreciate the uniqueness of the current moment. You understand that Placemaking is a process, not an outcome. Ideally, you're also familiar with the Project for Public Spaces and the way that we work. 2.) You understand and agree with what we are trying to achieve. You get that the Council isn't about making money or networking, but working with like-minded individuals to drive large-scale culture change to put place at the heart of public discourse. 3.) You have substantial experience with on-the-ground projects and initiatives. You're driven and you've got a few success stories under your belt--and probably even some failures that you've learned a great deal from. We're looking for people who don't just think about how to create great places--they roll up their sleeves, head on out, and do it themselves. 4.) You think holistically about place. You've worked on a variety of different projects, and you understand how various (sometimes unexpected) pieces fit together to create a great public destination. The term "silo-busting" gets your feet tapping. 5.) You have your own networks and organizations. You're not a rock, or an island. You have a track record of working with people from different backgrounds, disciplines, and communities, and you understand how important unlikely partnerships are to successful Placemaking. 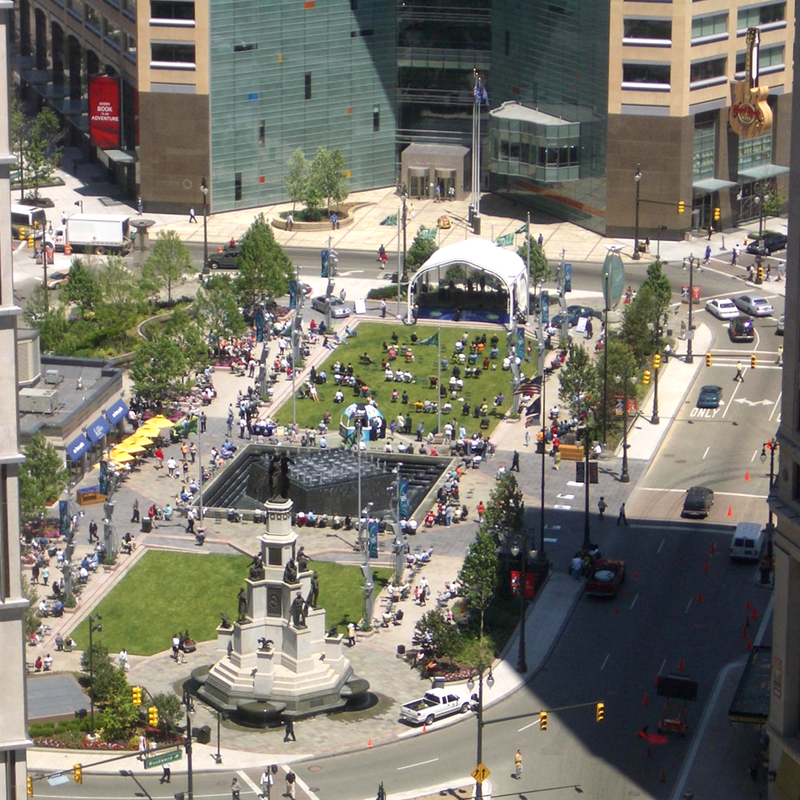 If you are interested in joining the Placemaking Leadership Council and attending our first meeting in Detroit this April, please click here to fill out a questionnaire that will help us to learn more about who you are and what you do. We welcome inquiries for this first round up until March 1st, 2013, and will work internally to shape a Council that will represent a diversity not only in professional experiences, but also in age, gender, cultural heritage, and international backgrounds. Please also indicate whether travel costs will be an issue, as we will be able to provide assistance to a limited number of Council members, based on need, through the generous sponsorship Southwest Airlines and contributions by other members. We're very excited to announce this new initiative, and look forward to working with more of the passionate Placemakers who make this movement so dynamic.